Following last year's phenomenal festival, when Rockingham really came of age, there were great expectations for this year's event. I had heard a few fans mutter that this year's line-up was not quite as strong, although personally I disagreed and happily was proved right. 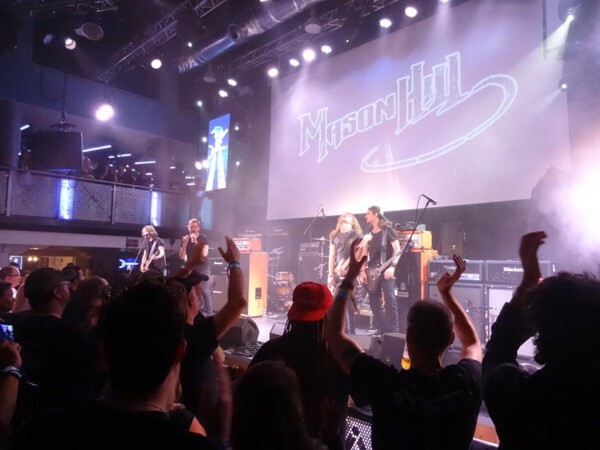 That said, sound issues throughout the whole weekend, and an unsavoury moment on the final day, nearly overshadowed what was another terrific weekend of high quality Melodic Rock music. Master of ceremonies, ARFM's Steve Price, who did a sterling job throughout the whole weekend, introduced the Rockingham All Stars (Charlie Castro - vocals/guitar; Jonas Nordquist – guitar; Nigel Bailey – bass; Irvin Parratt – keyboards; Gannett Ries – drums) to kick off the festival with a performance of 'Going To Rockingham'. The song contains more cheese than the Wensleydale Creamery, which I'd visited a week earlier, but did just the job to broaden the already huge smiles of the expectant crowd. I did hear the comment, "I thought Mason Hill were a young band?" which did make me chuckle. Scottish band Mason Hill had arguably the best sound on the Friday evening and took full advantage of their opening slot. They were slick and well drilled for a new band, with singer Scott Taylor impressing the most. He stepped out on stage and sang a capella over the intro tape before being joined by his band-mates for opening song 'No Regret'. Although his crowd address in between songs had my foreign friends (who speak perfect English) amusingly asking "Can you understand what he's saying?" I happily translated. Setlist:- No Regret / Survive / Hold On / Wait For You / Now You See Me / Against The Wall / Where I Belong. Massive were the only band I missed all weekend. I did not know much about the Aussie rockers, however, from all accounts they were The Amorettes of this year's festival; a definite Marmite group. 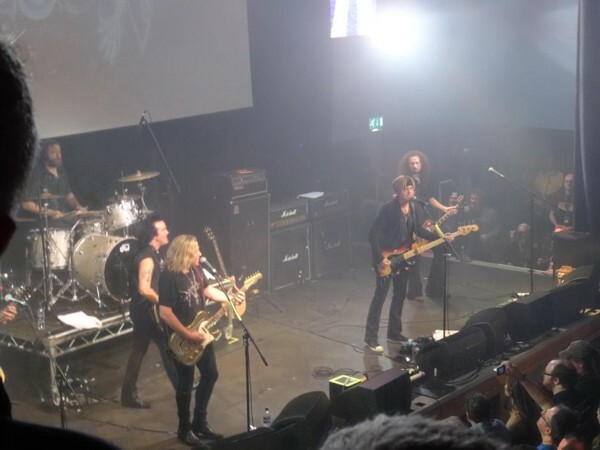 They were also the first band of the weekend to include a cover in their set, Deep Purple's 'Highway Star'. I returned from the pub in time to see Pink Cream 69 hit the stage. From my initial viewing position on the balcony, I barely recognised the opening couple of songs ('We Bow To None' and 'Welcome The Night') due to the poor audio. I relocated downstairs where the sound was still very muddy, but infinitely better than upstairs, and at least the songs were now recognisable. 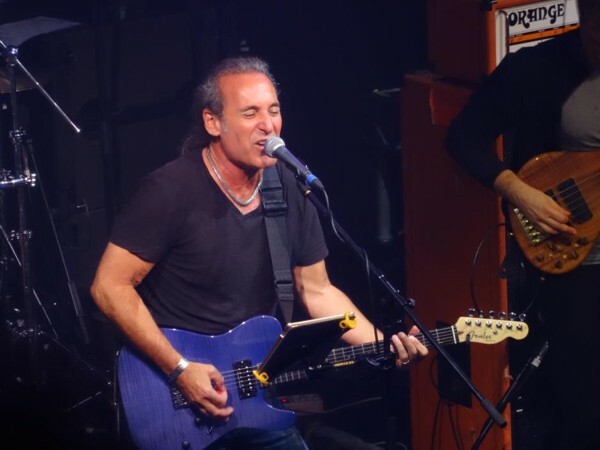 The band now only boasts one original member, guitarist Alfred Koffler, however, Burnley born singer David Readman has been with the band for over twenty years, but I was surprised to see Denis Ward missing from the line-up. Sound issues aside, it was a sparkling performance and a great set, highly focussed around last year's superb 'Headstrong' album. However, it was the final three songs of 'Do You Like It Like That', 'Break The Silence' and the classic 'Shame' where the German Hard Melodic Rockers went into overdrive. 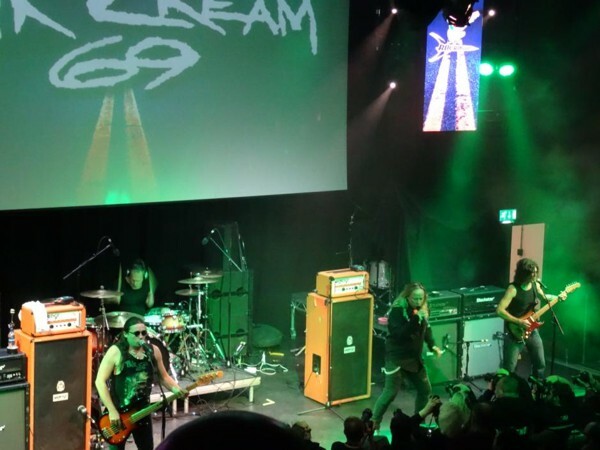 Based on their performance and setlist, Pink Cream 69 should have been an early contender for band of the weekend, but unfortunately, the aforementioned sound issues meant that this was never going to happen. Setlist: - We Bow To None / Welcome The Night / Twisted / Path Of Destiny / Talk To The Moon / Lost In Illusion / Man Of Sorrow / Walls Come Down / Livin' My Life For You / Bloodsucker / Do You Like It Like That / Break The Silence / Shame. The sound improved a bit (not much) for the Friday night headliners Vixen, but was still far from perfect. The crowd reaction to the band highlighted that it was a popular decision to have them headline, and they forged through a fourteen-song, largely well-balanced set. Pre-festival, I had posted a list of unofficial rules for the bands playing, and I kept getting knowing looks from friends every time a band broke any of them; Vixen broke two with a Roxy Petrucci drum solo and two covers, 'I Don't Need No Doctor', which featured Share Ross on lead vocals and Deep Purple's 'Perfect Strangers'. That said, the ladies along with the talented Tyson Leslie on keyboards, put on a fine performance and engaged the partisan audience. I'm impressed that each night the band pay tribute to their founding member Jan Kuehnemund, who sadly lost her battle to cancer five years ago (sadly another headliner were not as gracious to one of their past members). My personal highlight was the set closer, the Richard Marx penned 'Edge Of A Broken Heart'. I was fortunate this year to get access to the after-show party, especially as Boulevard were making an appearance. The Canadians did not disappoint with their six-song set, with a couple of songs taken from each of their three studio albums. Further sound issues in the conference room of the Crowne Plaza did not prevent Boulevard putting on a superb show that went down a storm with the lucky 350 fans who gained admission. The aforementioned sound problems, however, did ruin Ammunition's Åge Sten Nielsen's performance as he proceeded to sound check all the way through his set. His obvious annoyance at the poor sound, coupled with too much time talking to the crowd, saw many heading for the bar and even home. When he did eventually play, he was terrific. It was already 12.30am when Midnite City took to the front of the makeshift stage. They immediately summoned the crowd off their seats to stand at the front and played songs from their new album 'There Goes The Neighbourhood', interspersed with tracks from their excellent debut. Despite the fact that I was enjoying the performance, I only lasted half a dozen songs before retiring back to my hotel, knowing there were still two full days to go. Initially I had planned on going to the pub on Saturday lunchtime, but was pleased that I took the decision not to go, and instead watch Departed. Rockingham has a tradition of promoting young, up-and-coming bands and it's great to see these bands really taking the opportunity afforded to them. 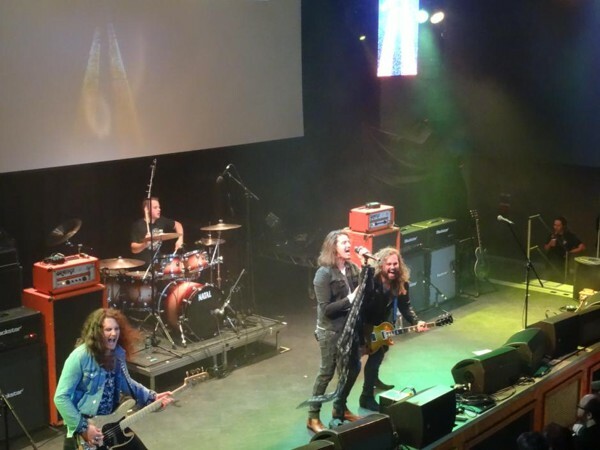 Departed were one of only three UK bands appearing on this year's line-up and were led by former Treatment guitarist Ben Brookland Bennett and the impressive lead vocals of Mark Pascal. They tore through a nine-song set, hardly pausing for breath. Their style of traditional old-school Rock was just what was needed to get the party started on the Saturday lunchtime. 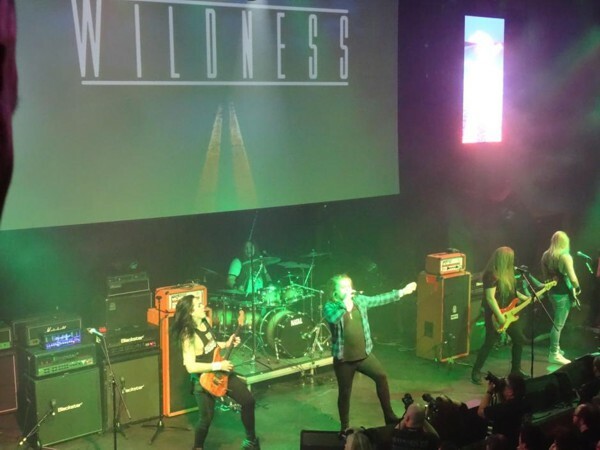 There was much anticipation when Sweden's Wildness took to the stage. Last year's debut album featured in many fan's top ten lists of the year. Unfortunately, sound issues and a singer (Gabriel Lindmark) much the worse for wear (intoxicated due to nerves? ), meant that this was never going to be the set stealing show of the weekend that many had predicted. It was very sad to see Lindmark making the effort but obviously struggling; hopefully, he will learn from his error of judgement. The rest of the band were tight and the quality of the material was evident, and the Rockingham crowd were willing the band along, particularly during the excellent 'Turning The Pages' and set closer 'War Inside My Head', where several hundreds of fans assisted Lindmark on lead vocals. Talking to most people, they are willing to give this young band a second chance. On this occasion, however, it was truly an opportunity missed. Bigfoot had suffered the loss of their enigmatic singer Ant Ellis a few months before the festival; however, they have found an equally impressive replacement in Sean Seabrook. 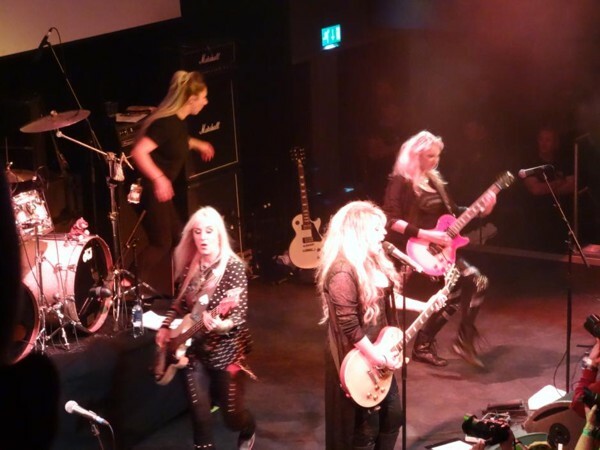 There were plenty of fans cheering on the Wigan-based Melodic Hard Rockers from the get-go; however, I did notice a few more people taking notice when they played 'The Fear', with its great riff and even better chorus. 'Blame It On The Dog' maintained the pace and quality, whilst the closing track 'Uninvited' was dedicated to Daniel Bolton, who sadly passed away a few weeks ago, at the tender age of twenty-eight years. Daniel had auditioned for the vacant front man position earlier in the year, so it was a real touch of class from guitarist Sam Millar to say a few words (a shame that more experienced musicians did not show this sort of class later on in the weekend). I knew it meant a lot to my friend, and Daniel's dad, Dave, who was understandably emotional. I was afraid the sound problems were going to ruin Ammunition's set, as Åge Sten Nilsen continued where he'd left off the previous night at the after-show party. 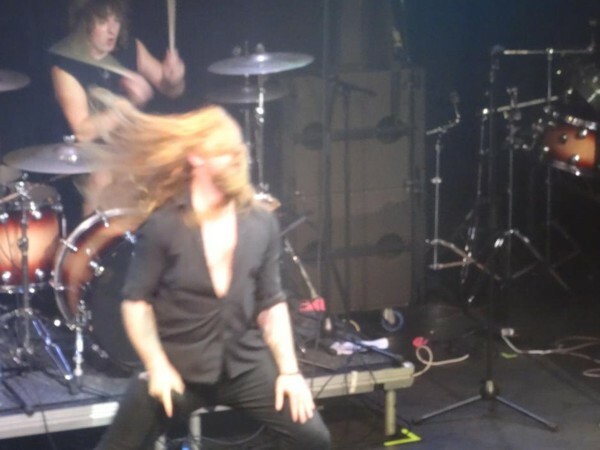 Fortunately, however, the latter did not transpire and the Scandinavians rifled through a ten-song set of high quality Melodic Hard Rock, from set opener 'Virtual Reality Boy' to the classy 'Road To Babylon'. 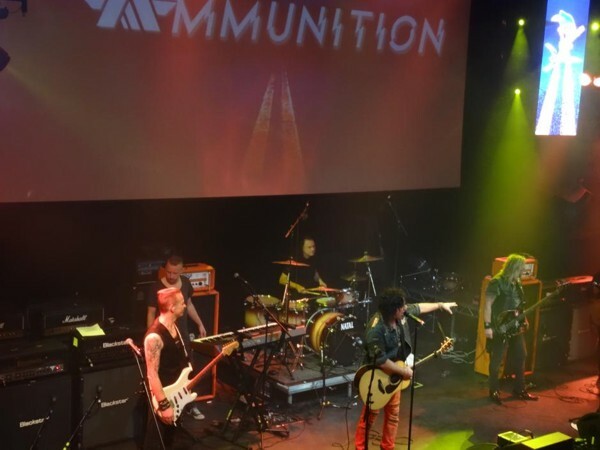 Ammumition were on a roll with 'Wild Card', 'Freedom Finder', 'Silverback' and 'Wrecking Crew' and had the crowd at fever-pitch level. I was therefore surprised that they concluded their set with the more somber, thought-provoking 'Eye For An Eye'; however, I was not complaining as this is one of my favourite songs by the band. Personally, I feel that Åge Sten Nilsen needs to cut the inter-song chatter, particularly in a festival environment, and just concentrate on the music; when he does, there are few finer in the business. Boulevard were the band I had been looking forward to all weekend and they suitably delivered, producing a breathtaking performance that matched their Firefest appearance four years previous. It was jaw-droppingly good and thus proved the old adage that lightning can indeed strike twice. For a band that have only played a few times together over the last twenty-five years, they're slicker than an oil spill. Their set comprised of songs from each of their three studio albums (I'd have been happy if they'd played two and a half hours), which created a perfect hour of pure AOR. Even those who normally prefer their music slightly heavier were rightfully impressed. 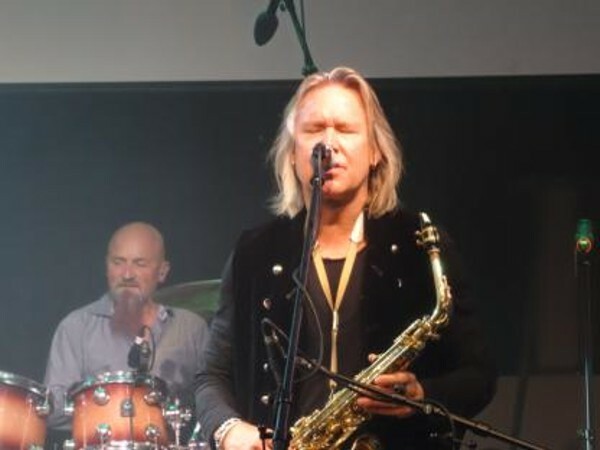 Fireman David Forbes has the voice of an angel (and a personality to match), and how many Rock bands do you know with a full-time saxophone player (Mark Holden) who they put up front and centre of the stage? 'Missing Persons' had keyboard player Andrew Johns singing extremely high backing vocals, whilst 'Dream On' and 'Crazy Life' had us AOR fans in heaven. The Canadians had promised a big surprise and with the introduction of the Leeds Pop-Up Gospel Choir during 'Confirmation' they duly delivered and left the crowd totally mesmerised. For me they only had one song in their catalogue to follow that spectacle, and the band were obviously on the same wavelength; 'I Can't Tell You Why' is one of the most beautiful songs of recent years, and had me close to tears with its pure majesty. Unfortunately, before we knew it, the band was wrapping up their set with the awesome 'Talk To Me' from the classic 'Into The Street' album. The applause they received as they left the stage indicated that we had all just witnessed something very special. I had predicted, pre-festival, that this would be the band of the weekend and post-festival I still concur with that opinion; however, there were several bands who would give them a run for their money for that honour. If ever there was a home-banker, then it had to be Tokyo Motor Fist. 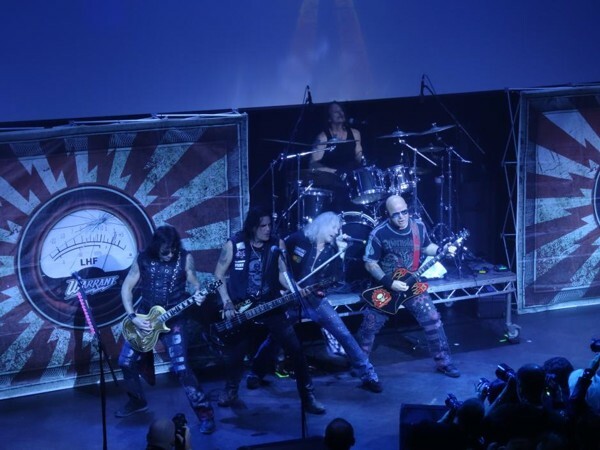 The Melodic Rock supergroup of Ted Poley (lead vocals), Steve Brown (guitars and vocals), Greg Smith (bass and vocals) and Chuck Burghi (drums), making their debut live performance, put on the party set of the weekend. They interspersed their set with songs from the superb debut album and covers from the individual band members' bands/ex-bands. 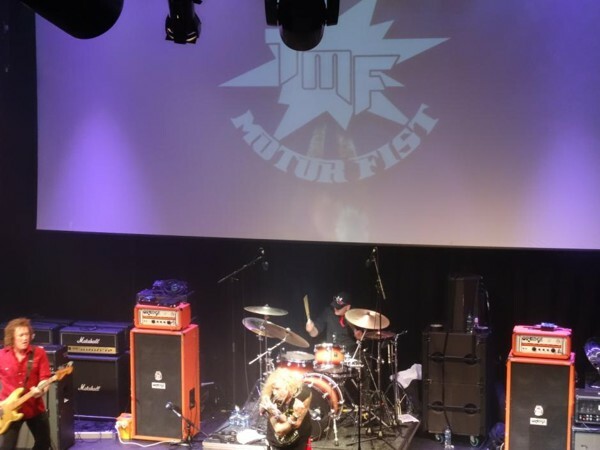 The first four songs were TMF originals, before a plethora of covers, including a great rendition of Rainbow's 'Street Of Dreams' featuring Greg Smith on lead vocals; he also took the lead on the Ted Nugent classic 'Just What the Doctor Ordered'. Steve Brown took the microphone on Trixter's 'One In A Million' and 'Give It To Me Good', making it abundantly clear why Def Leppard utilised his talents when Vivian Campbell was temporarily out of the band receiving treatment for cancer. However, the covers that everyone wanted to hear were from the ultimate Melodic Rock party band, Danger Danger. Although expected, I was disappointed that one of these was 'Monkey Business'; but, was more than happy with the brilliant 'Bang Bang'. A new album has been promised and the band left us baying for more, after concluding with the superb 'Pickin' Up The Pieces'. An early start time meant that I missed the beginning of Saturday night's headliners Nelson. They were very professional and still have the vocals and harmonies that made them AOR favourites in the first place. They were another band that obviously forgot to read my memo reference cover versions, playing no less than five in their eighteen-song set. 'Garden Party' by their dad could be forgiven, as could the brilliant rendition of The Outfield's 'Your Love'; however, Howard Stern's 'Silver Nickels & Golden Dimes' could easily have been replaced by an original number; and Led Zeppelin's 'Whole Lotta Love' (Scotty Bratcher on lead vocals) and The Kinks' 'You Really Got Me' should, in my opinion, have no place at a Melodic Rock Festival. The acoustic songs mid-set were superb, but the real highlights were the big hits from the debut album, 'After The Rain' and '(Can't Live Without Your) Love And Affection' where the Rockingham crowd went wild. Steve Brown joined the band for the two song encore of the aforementioned 'Your Love' and 'You Really Got Me'. That concluded an excellent day, with the promise of another great day to follow. Young Swedish band Creye have been causing quite a stir in Melodic Rock circles, so it was unsurprising to see a relatively full venue for the start of Day Three. 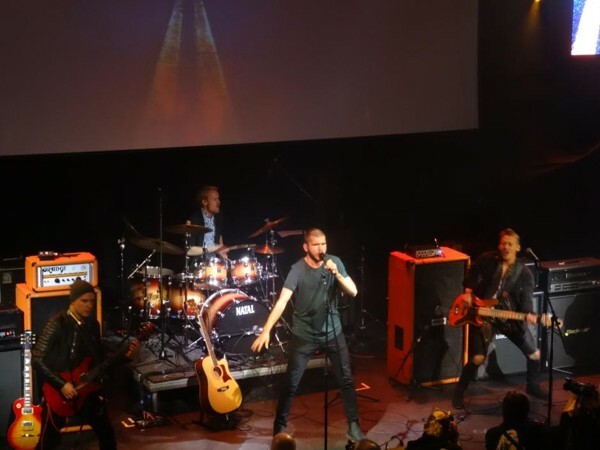 Their debut album was released a week before the festival, along with the news that their singer, Robin Jidhed, would not be performing at Rockingham, so the band drafted in August Rauer, who did such a sterling job. A few days after the festival it was announced he had the permanent gig with the band. If the band had any nerves, then they masked them pretty well and by the time they played 'Christina' mid-set, most fans had already given them the thumbs-up. For a debut UK performance it was very polished, and hopefully, it will be a stepping stone to future success. 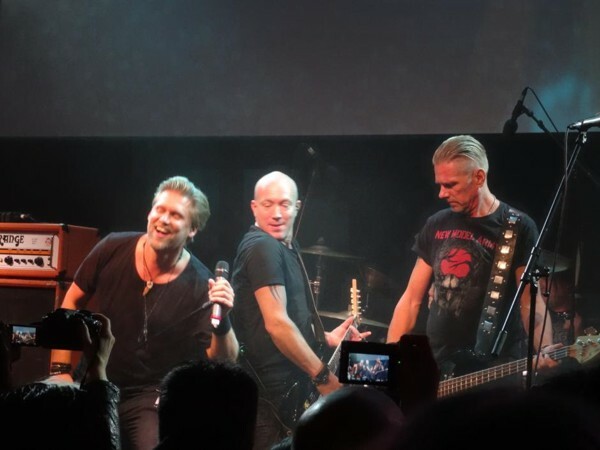 Despite continuing sound issues, notably at the start of their set, fellow Swedes Age Of Reflection took the opportunity to enhance their profile and gain a host of new fans in the process. There was a real confidence, not to be confused with arrogance, about their performance. Initially, I thought they may have peaked too early, playing my favourite songs from their glorious debut, 'Borderline', 'Evelyn' and the title track 'In The Heat Of The Night'; however, they just built on these and even the new song 'Go' showed that they still have the song writing abilities. Lars Nygren's voice on 'Every Time' was magnificent and they brought their triumphant set to a rousing climax with 'Blame It On My Heart' and 'The Mirror Never Lies'. 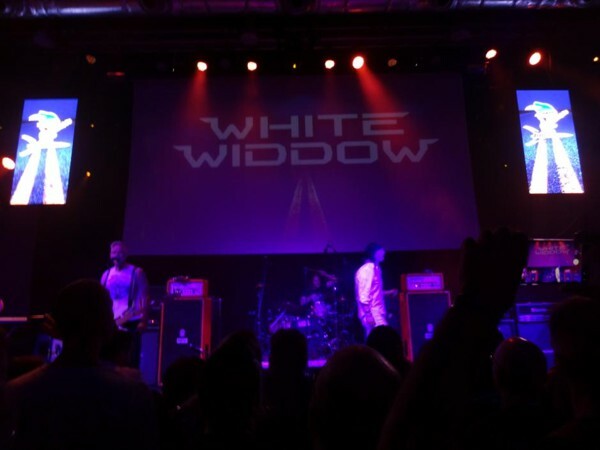 This was my fourth time seeing the Aussie Melodic Rockers White Widdow and easily the best. Singer Jules Millis, whom I consider one of our own (he is a huge fan of the genre and knows as much, if not more, than the ardent fans in the audience), sometimes struggles to deliver live, compared to what he puts down in the studio, but the old adage "less is more" certainly paid dividends today. It was a nice touch to dedicate 'Serenade' to Dean And Deb Buckley for their wedding anniversary. The final song was a cover, and normally I would be bemoaning the band's decision, however, a cover of the Icon classic 'Danger Calling' was inspirational, Icon being arguably the band that most fans want to see at Rockingham. After last year's stunning performance by Blanc Faces, it was a no-brainer to get Robbie LeBlanc back with Find Me. Initially formed as a Frontiers Project band with singer Robbie LaBlanc and multi-instrumentalist/producer Daniel Flores, who took the drum stool, the pair assembled an all-star band for this show; Philip Lindstrand (rhythm guitar), Michael Palace (lead guitar), whom I did not recognise at first as he'd shaved all his hair off, Jonny Trobro (bass) and Rolf Staffan Pilotti (keyboards). Out of all the musicians on stage throughout the weekend, Lindstrand surely won the award for having the most fun, looking like the kid who'd been given the key to the toy store! There also can be no argument that this was the vocal performance of the weekend, especially the solo of the Blanc Faces 'It's A Little Too Late' which left me with goosebumps. I turned to a friend and said that you won't hear a better vocal performance all weekend, and then they perform a sublime cover of the Survivor classic 'Desperate Dreams'. Dedicating a song to the late, great Jimi Jamison was always going to bring the house down. A new album has been promised for next year and new song 'No Tears In Paradise' indicates that this should be something to really look forward to. I don't think there would be many complaints should Robbie LeBlanc be invited back for an unprecedented third year running. You can always guarantee Canadians to bring a bit a panache and professionalism to the proceedings. Glass Tiger did exactly that, and their set of Celtic-influenced Pop-Rock was a pure joy to experience. Although aware of the band from the Maple Leaf country, fronted by Scotsman Alan Frew, I only first heard any of their music following the announcement that they would be playing at this year's festival. I was subsequently looking forward to this show and, man, did they deliver. Back in the day, Glass Tiger recorded songs with The Chieftains ('My Song') and Rod Stewart ('My Town'), with Frew jokingly remarking how Stewart doesn't call him any more now he's famous. Closing number 'Don't Forget Me (When I'm Gone)' had Frew failing miserably to get the crowd to sing in perfect tune. Similar to Boulevard the previous day, the Rockingham crowd recognised class, even if the music might not necessarily be in their wheelhouse. 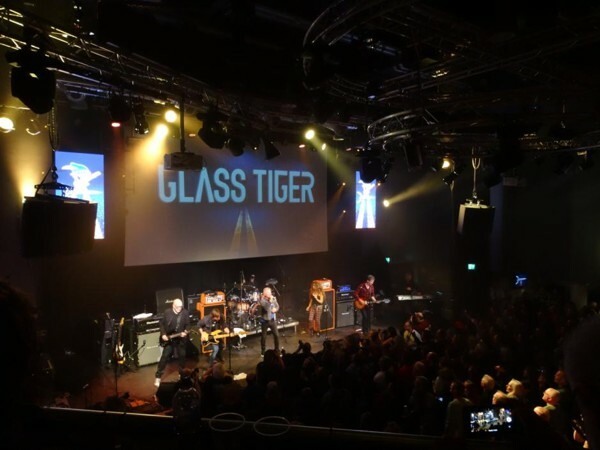 A lengthy, deserved standing ovation was given as Glass Tiger took the accolades for one of the highlights of the weekend. So how do you follow that? Pretty Maids were the antithesis to Glass Tiger musically, but the crowd loved both bands in equal measures. 'Mother Of All Lies' saw the great Danes get off to a pulsating start, with their proverbial foot firmly placed to the metal. The excellent 'Kingmaker' kept up the momentum, and it was more than evident we were witnessing one of the great sets of the weekend (of which there had already been many). My personal highlight was the incredible 'I.N.V.U. ', which began with a short cover of the Pink Floyd classic 'Another Brick In The Wall'. Fan favourite 'Little Drops Of Heaven' securely put the Maids in the top five bands of the weekend and they were just coming round the last bend with the finish line in sight, when their set was abruptly curtailed. 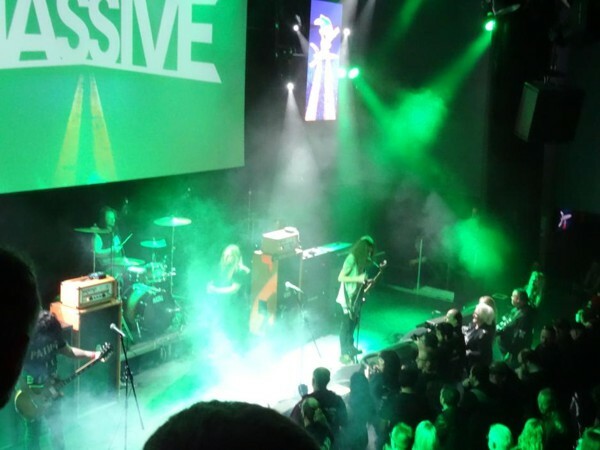 Due to the earlier bands overunning, the Maids had already been forced to cut their set short by three songs; however, pulling the plug on them ninety seconds before the conclusion of their last song, 'Love Games', was an absolute disgrace and totally disrespectful to both the band and the fans. I don't know the facts for sure; however, the consensus of opinion was that it was one of Warrant's backstage crew that made the decision. What I do know is that it meant that the Maids were unable to take the curtain call at the end of their set for what I'm certain would have been the loudest applause of the weekend. 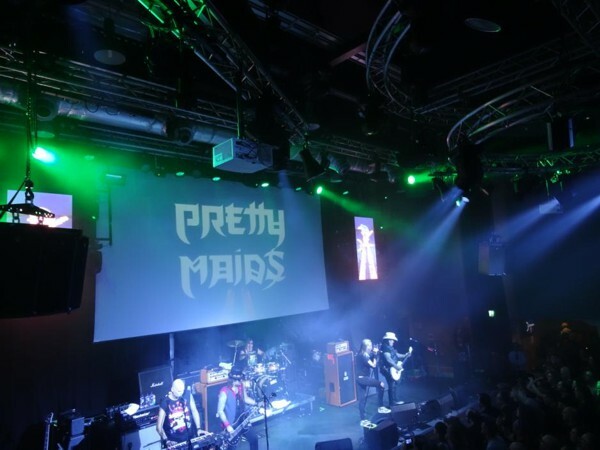 Just a thought, I think it would be cool and appreciated by most, if the Pretty Maids were invited back next year to headline the Friday night. My review of Warrant can best be described as the good, the bad and the ugly. Firstly, the good: their set was full of Warrant classics from the first three albums and the songs were executed to near perfection; a great vocal performance by Robert Mason, solid lead by Joey Allen and drumming and backing vocals of drummer Steven Sweet. 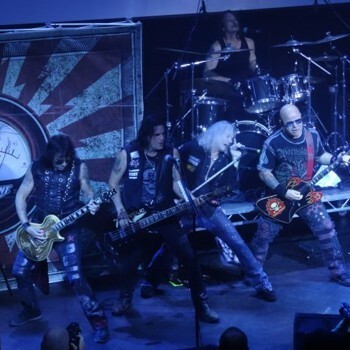 The bad: Mason's inter-song rants, bassist Jerry Dixon and rhythm guitarist Erik Turner obvious "Rock Star" attitude, the failure of the band to acknowledge the contribution of Jani Lane (without his songs they would struggle to headline my back garden). And finally, the ugly: Mason calling out Pretty Maids for Warrant having to cut their set short. Mason had obviously not realised that the Maids had gone down a storm, and he certainly did not appreciate the values that the bands and fans share at this festival. If the weekend had ended with the classic 'Uncle Tom's Cabin' then I would have concluded that this was one of the best ever Sunday night closing shows. However, Mason's uncalled-for, foul-mouthed tirade left a sour-taste and lost him the respect of many a fan. The latter was a real shame, as this had once again been a tremendous three days of the finest Melodic Rock. - Thanks once again to Rich Cliffe and his team for organising such an amazing festival of Melodic Rock music. I hope you realise sir, how the vast majority of fans appreciate your hard efforts. - Thanks to all the bands who played, and all but one getting into the true spirit of the festival. - Thanks to Sam Compton and Andy Nathan for assistance with the setlists, you are both real stars. Age Of Reflection and Bigfoot for personally supplying me with their setlists. - Finally, a big thanks to all my friends, fellow fans and musicians who took time to talk, laugh and drink with me over the weekend. Hope we can all do it again next year. Quality in depth Review, a great read as I missed a few of the Sets, Boulevard and Find me were my Highlights but the whole 3 Days and the After show were great fun, Love this Festival and long may it continue.